Na h’Oganaich is one of the most important groups in Gaelic culture, paving the way for Runrig and Capercaillie in giving young Gaels a pride in their own language and in taking Gaelic songs to a wider audience in Scotland and across the world. Formed in 1971, Na h’Oganaich – or The Young Ones – brought together three musicians whose respective backgrounds coalesced in a way that could hardly have served the music they played better. Although they grew up in Edinburgh and Peterhead, where their father was in the prison service, siblings Margaret and Donnie MacLeod spent all their holidays with their parents’ families on the Isle of Lewis and regarded Gaelic as their first language. Their maternal aunt Annie MacKenzie was a music teacher in South Uist and Lewis who had collected a large repertoire of traditional Gaelic songs, passing many of them on to her Gaelic singing protégé, Margaret. 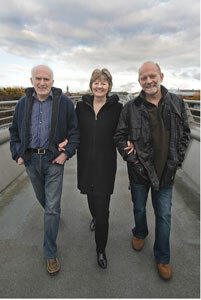 Shortly after winning the gold medal at the National Mod in Oban in 1970, Margaret met Noel Eadie, a Glasgow-based musician who was then playing with accordionist John Carmichael’s band, and when she told him that her brother, who at the time was working as a merchant seaman, was learning to play guitar, they decided to form a band. As well as teaching her songs, Margaret’s aunt had told her about Murdo MacFarlane, although she didn’t know any of the Melbost Bard’s songs until Donnie MacLean, then of the BBC and later of An Comunn Gaidhealach, played her a tape of a Lewisman singing traditional style songs that turned out to be his own. Margaret instantly became interested in the songs on this tape and the new group immediately acquired its own repertoire which, with MacFarlane’s blessing, presented Gaelic song in a way that was true to the tradition and yet belonged in the here and now. Na h’Oganaich sang two of MacFarlane’s songs — Mhorag leat Shiubhlainn and Oran Cladaich — at the National Mod in Stirling in 1971 and won the folk group competition. As part of their prize they represented Scotland at the Pan Celtic Festival in Killarney and singing another of MacFarlane’s songs, Mi le m’Uillin, they won that, too. A new sound was born. Between 1971 and 1975, Na h’Oganaich recorded three albums – The Great Gaelic Sound of Na h’Oganaich, Gael Force Three and Scot Free – for the Decca Records offshoot label Beltona. They also became hugely popular as a live attraction, filling village halls to standing room only on their summer tours of the Highlands and Islands and taking Gaelic songs with a modern sensibility to appreciative audiences in England, Wales, Brittany, Canada and the U.S.
By 1976, Noel had taken up a post as a college lecturer and he went on to teach science at the Nicolson Institute in Stornoway until he retired in 2009. Margaret and Donnie toured as a duo with backing musicians before Donnie moved into Gaelic television, becoming known to Gaelic speaking children as Donnie Dotaman and going on to produce television programmes and documentaries. Margaret continued singing, forming Albany with Billy Anderson and then, in 2007, Na h’Oganaich reprised their music at Celtic Connections and found a young audience who knew all their songs. With a new album in the pipeline the Na h’Oganiach story continues.